Full Moons are a time to look at how our external world is influencing our internal sense of self. A beautiful moment to let go of what no longer serves our higher selves, ultimately opening space for a new direction. Mandy will guide an evening of introspection as we harness the unique energies of the full moon and TOTAL lunar eclipse. Reaffirm your New Years resolution as we harness the heightened energy of this rare total lunar eclipse (last one for 3 years). We will discuss the meaning of the Full Moon/eclipse in relationship to the action and environment of our lives; understanding why and how we should practice for our optimal healing. Our intentions will be supported by the energetic components of this day as we embrace the power of 'letting go' & yielding to our paths direction. 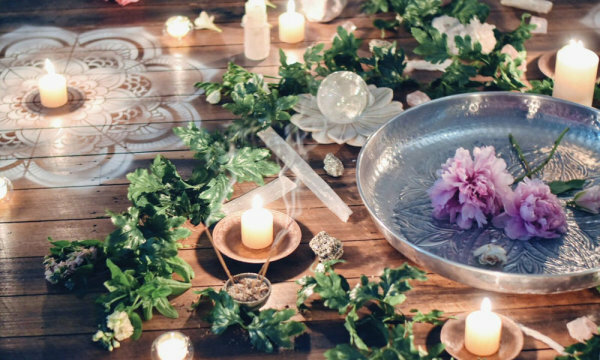 We will explore the knowledge of the moon influences through reflective journaling, intention setting and a soothing yoga practice with seated meditation to seal your cultivation & release. We honor ourselves by getting 'out of our own way' and trust the divine creativity that directs our path. A Special Gift is included in each class and it's Reiki infused! "Happiness is your nature. It's not wrong to desire it. What is wrong is seeking outside when it is inside." Use the Full Moon & Eclipse as a mirror to how your external world affects your internal self & well-being. ~ A Lunar Ritual Gift set to support your practice! Full Moons are a time in the lunar month where the mind is particularly creative and/or reactive. It is therefore considered beneficial to dedicate additional time to internal practices such as meditation, recognize & release, and yoga. This full moon is accompanied by a TOTAL Lunar eclipse, making any spiritual practices much more potent and causing the veil between the conscious and subconscious mind to thin. This occurrence is completing a cycle from the Lunar Eclipse from June 2019. This lunar eclipse completes a 2-week cycle from the partial solar eclipse, where the possibility of change can come forward as much as ones awareness is consciously active.